Many iPhone users are fond of updating iOS system. But when you are attempting to restore or update your iPhones, you may be annoyed by iTunes error 3194 which is short for “The iPhone ‘iPhone’ could not be restored. An unknown error occurred.” Actually, iTunes error 3194 is a common error that occurs when you downgrade or upgrade your iPhone unsuccessfully. In details, Apple does not provide support in this area so this error happens. Part 1: What Is the Cause for iTunes Error 3194? Part 2: How to Fix iTunes Error 3194? So what are the reasons for this error? And what does iTunes error 3194 mean?Usually, the 3000 series code errors indicate that iTunes can not connect to the gs.Apple.com server via port 80 or 443. If you have difficulties in updating or downgrading your iPhone for the first time, next time when you try again you will get “Error 3194”. Overall, it may be due to the incorrect configuration of the security software. Sometimes the Anti-virus software may block some files from accessing data. Or firewall software which has an entry in the host files to gs.Apple.com server is disabled to allow iTunes to run. Or it may also be related to your own network environment. So how to fix iTunes error 3194? Next I will introduce several ways for your reference. Step 1. You need to quit iTunes on your computer. Step 2. Open the host file on your computer. Step 3. 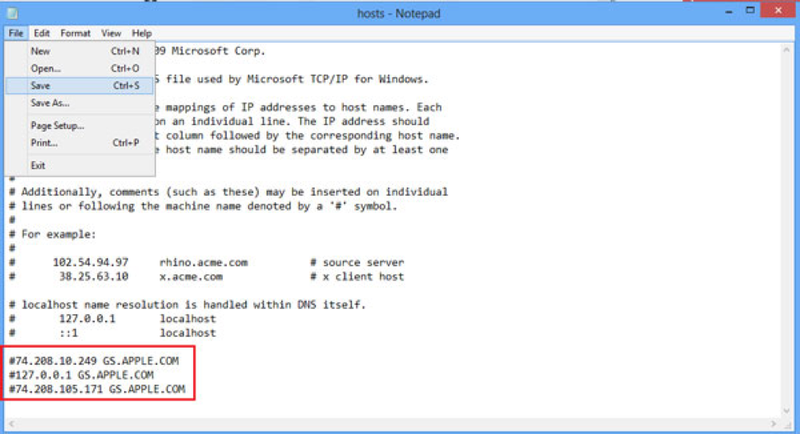 Open the hosts file with administrator rights. Step 4. 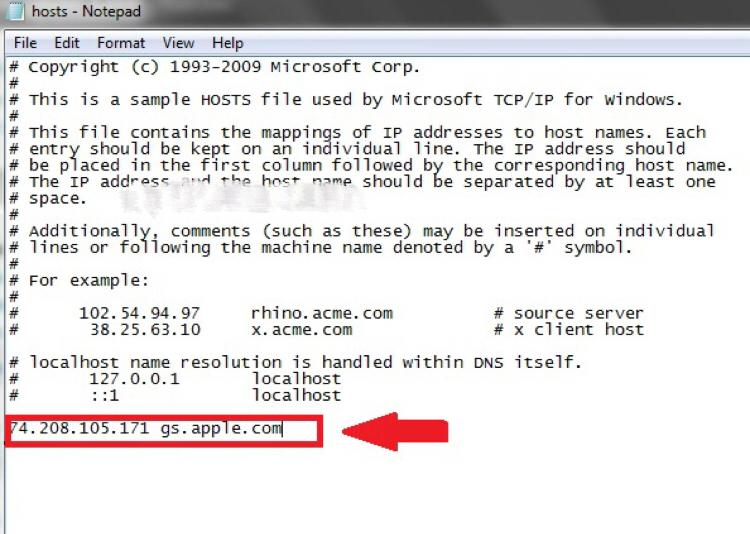 Find “74.208.105.171 gs.apple.com” in the host file at the bottom. If there is no such a line, just add. If you can find at the bottom, just add a “#” to the front. And then save the host file. For Mac, sometimes it may show 74.208.10.249 gs.apple.com instead of 74.208.105.171 gs.apple.com. They represent the same error. For Windows, you can also see 74.208.105.171 gs.apple.com at the bottom. Step 5. Connect your iPhone with computer. Step 7. Switch your iPhone to enter DFU mode. First, turn off your iPhone by holding Power button.Second, hold Power and Home button simultaneously for 10 seconds and then release Power button. Then hold Home button continuously until iTunes shows “iTunes has detected an iPhone in recovery mode”. Step 8.Update the latest firmware in your iPhone. Step 9. After restoring iPhone and enter your host file again. Just remove the last line at the bottom “74.208.105.171 gs.apple.com”. In most cases, the iTunes error 3194 will be fixed successfully. Fixing iTunes error 3194 via iTunes has lots of similarities with the above method 1. Only step 4 and step 9 are different. Step 2. Find host files on your computer. Step 3. Open the host files. Step 7. Enter DFU Mode by holding Power button to turn off your iPhone and hold Power and Home button simultaneously for 10 seconds, then release Power button. Last hold Home button continuously until iTunes shows “iTunes has detected an iPhone in recovery mode”. Step 8. Update the latest firmware in your iPhone. Step 9. After restoring the iPhone, enter the host file to remove the three lines you just added recently. And until now, the repair has been completed and the iTunes error 3194 will be fixed. Step 1. Download the iOS firmware you wish to upgrade or downgrade. Step 2. And Download the latest version of TinyUmbrella. Step 3. Connect your device and close iTunes. Step 4. 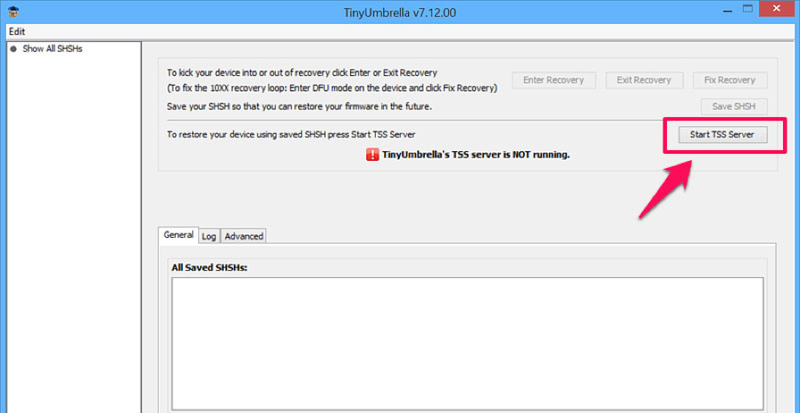 Open TinyUmbrella and then click on the ‘Start TSS Server’ button. Step 5. The TinyUmbrella software will run. Step 6. Make sure your iPhone has entered DFU mode by following the part we have done before. That is the whole process of fixing iTunes error 3194 by TinyUmbrella software. Besides, you can also check your internet connection when this iTunes error 3194 happened. Or you can try to reboot your computer, do not run anything but iTunes. Just try all the methods above out and you can find a perfect solution for your iPhone.